In the 1993 Supreme Court case of Daubert v. Merrell Dow, the court established a new standard for the admissibility of expert testimony in federal court. Following this decision, the Daubert standard has been a critical hurdle in disputes over the admissibility of financial expert testimony in commercial and securities litigation. This webcast will provide an update on the role of Daubert in cases involving financial expert testimony. Our panel will examine recent case law applying Daubert to such cases, as well as key concepts of damage theory in commercial litigation such as the “But For” concept, lost profit damages, destruction of business damages, causation, reasonable certainty/speculation, and reasonable foreseeability/hindsight. In addition, the panel will discuss underpinnings of damage theory such as the claimant’s past financial performance, and the ability of the claimant to penetrate the market or raise debt or equity capital. 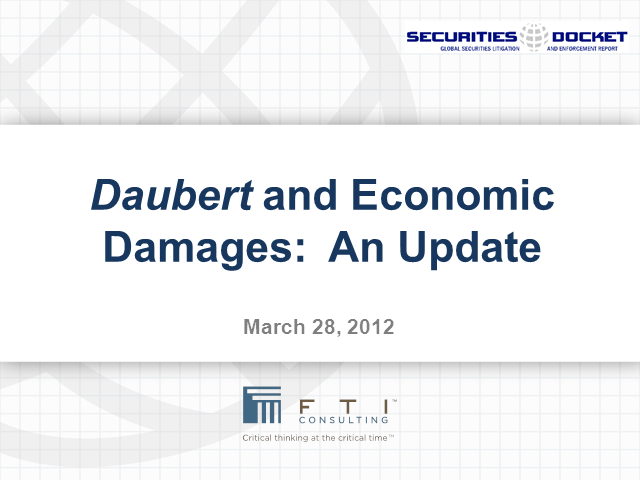 Finally, the panel will present a detailed case study illustrating many key Daubert issues and damages.